Iran's President Hassan Rouhani (R) welcomes British Foreign Secretary Philip Hammond at the start of their meeting in his office, in Tehran, Iran, Aug. 24, 2015. British Foreign Secretary Philip Hammond said Monday that international sanctions that have hobbled Iran's economy could be eased as soon as next March, with Tehran and the West rebuilding their ties as the accord to restrain Iran's nuclear program takes hold. The British top diplomat, on a visit to Tehran, said he expects Iran and the United States could endorse the deal by October. He said that if Iran meets its commitment to curb its nuclear development, "We could be talking as early as next spring to start to see sanctions lifting off," referring to the March-to-May period. Britain and Iran reopened embassies in Tehran and London Sunday. Iranian President Hassan Rouhani said Monday the world will eventually look at the deal as the dawn of better relations with the Islamic Republic. "The negotiating parties will realize in the future that interaction rather than confrontation with Iran was the right approach," the official IRNA news agency quoted Rouhani as saying. FILE - U.S. Senate Majority Leader Harry Reid, with other Democratic Party Senate members in the background, is seen on the steps of the U.S. Capitol in Washington, D.C. In mid-July, the United States and five other world powers reached an agreement with Iran to limit the country's nuclear program in exchange for economic sanctions relief. A key U.S. senator, Senate Democratic Minority Leader Harry Reid, voiced his support for the deal Sunday, saying it is "the best path to stop Iran from obtaining a nuclear weapon." His support makes it less likely that Republicans in Congress will be able to muster enough votes to block the agreement. U.S. opponents of the deal and Israel say there would be too little oversight of Tehran's nuclear program and that it would unlock billions of dollars in assets for Iran that it could use to foment aggression in the Middle East. Reid said part of his support for the deal lies in what he called the lack of any viable alternative put forth by those who oppose it. "It is a fantasy to say that if Congress rejects the agreement, the administration can simply go back and get a better agreement," he said. "That is not a real option and we should not pretend that it is." He also emphasized his view that the negotiations by the U.S., Britain, China, France, Russia and Germany resulted in terms that will help protect Israel, a strong U.S. ally, from the possibility of being threatened by a nuclear-armed Iran. 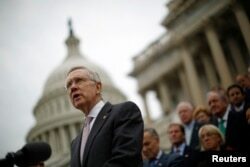 "Ensuring Israel's security is of the utmost importance to me," Reid said. "I support this deal because I believe it is the best option to halt any Iranian nuclear weapons program and therefore protect the State of Israel." Iran has long insisted its nuclear program is solely for civilian purposes and does not include a weapons program. The international negotiations that ended after multiple rounds of contentious talks and extended deadlines were aimed at ensuring Iran's program is peaceful. The agreement cuts back Iran's nuclear activity to lengthen the amount of time it would take for Iran to get itself to a place where it could potentially build a nuclear bomb, and includes the threat of re-imposing the harsh sanctions that have badly hurt the country's economy over the past decade. Before the deal was reached, the U.S. Congress demanded President Barack Obama give lawmakers a chance to review any agreement before it went into effect, the result of which is a 60-day period that runs out on September 17. Congress has until then to vote for or against the terms, in effect choosing whether to allow the sanctions it has imposed to be lifted and thus completely fulfill the U.S. side of the deal. But Obama has promised to veto a rejection of the deal, which then would force both chambers of Congress to muster a two-thirds vote to override the veto. Republicans hold majorities in both the House and Senate, but not so big that they can achieve a veto override on their own. To block a possible override, Obama needs the support of 34 senators. With Reid, he has 27 Senate Democrats who have said they are for the deal, while another 15 have not yet publicly declared a position. Democrats Chuck Schumer and Robert Menendez said they will vote against the deal. In the larger House of Representatives the situation is less clear, with about a third of the members not yet publicly saying how they would vote. But of those who have taken a position, 16 Democrats have said they will not support the agreement. House Republicans would need at least 27 more Democrats to join their side to reach the two-thirds threshold for a veto override. Congress will focus on the Iran nuclear deal when it returns from recess on September 8. In another development, German Foreign Minister Frank-Walter Steinmeier said on Monday he plans to travel to Iran in October.